We are now offering gift certificates for those that would like to purchase them as a gift for a friend or loved one. 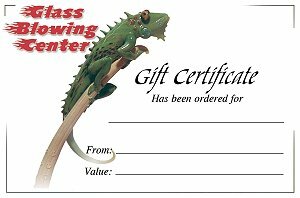 These gift certificates are only available for use at the Glass Blowing Center, and are not available for online purchases. Don't forget to print your temporary Gift Certificate! Please Note: Gift Certificates are redeemable only at the Glass Blowing Center and not online. A temporary certificate can be printed by clicking on the gift certificate to the right. A redeemable gift certificate will be mailed after the payment is received and processed.